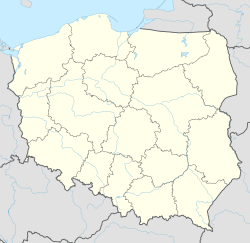 Dobre Miasto [ˈdɔbrɛ ˈmʲastɔ] (German: Guttstadt (help·info)) is a town in Poland, in the Warmian-Masurian Voivodeship with 10,489 inhabitants (2006). It is situated in the northwestern part of the Masurian-Land District in the heart of the historical region of Warmia (Ermland). It is also the seat of Dobre Miasto Commune which consists of the main town and 21 village administrative divisions, with a total population of 16,014. Dobre Miasto was founded on the place of a destroyed Old Prussian settlement. It received town privileges on 26 December 1329. The name of the town was spelled in different ways: Guddestat, Godenstat, Gudinstat, Gutberg, Gutenstat, Guthenstadt, Guthinstadt. The Latin name of the region (Pogesania) was derived from the Old Prussian word gudde (a bush/thicket). It is possible that the name of the town originated from this word. The Teutonic Order changed the Old Prussian pronunciation of the name into Guttstadt. However, as early as in 1336 the Latin translation of the name appeared - Bona Civitas. The present-day Polish name is a literal translation from the German language; in English both Guttstadt and Dobre Miasto mean "good town". The first burgomaster of the town was Wilhelm von Wormditt. The coat of arms of the town was a deer holding an oak-twig with two acorns. The town tinctures were white (argent) and green (vert). The patron of the town was Saint Catherine of Alexandria. In 1347 a Collegiate Chapter was transferred here from Glotau, which event was of great importance for further development of Guttstadt. In the course of the following decades the canons erected a church, a parish school and a hospital. The town, similarly as the whole region of Warmia, was the scene of different war campaigns. As the result of one of them Guttstadt was incorporated into the Kingdom of Poland in 1466. The 16th century was a period of peace, which ended abruptly with Swedish invasion in 1626. The Swedes overran the town several times but the inhabitants suffered most severely in the years 1655-1660. In 1772 the town was incorporated into the Kingdom of Prussia in the First Partition of Poland. The population of the town numbered 1831. In 1807 Guttstadt was seized in turn by the French, the Prussians and the Russians. In the Battle of Guttstadt-Deppen on 5 and 6 June 1807, the Russian army under General Levin August, Count von Bennigsen attacked Marshal Michel Ney's French corps. Though badly outnumbered, Ney conducted an effective rear guard action and escaped to the southwest across the Pasłęka River with most of his troops. Napoleon Bonaparte spent a night in the Collegiate between 8 and 9 June 1807. The Collegiate chapter was dissolved and its properties were parcelled out on the strength of the edict issued by King Frederick William III of Prussia on 5 October 1810. In the years 1830-1834 the evangelical church was erected, mainly thanks to the donations of Frederick William III. During World War II, Guttstadt was 65% destroyed during its capture by the Soviet Red Army and the NKVD. After the Potsdam Conference the town was placed under Polish administration and renamed Dobre Miasto. The town's German population was expelled from their home towards the remainder of Germany. On 1 August 1945 a Soviet garrison handed over power to Jan Majdecki, the first post-war mayor of the town. The Gothic collegiate complex built from 1357–1389, with a splendid church, on which Pope John Paul II conferred the title of minor basilica (1989). Undoubtedly, one of the biggest tourist attractions beside the magnificent interior and furnishings of the church is the organ with 49 tones and 3522 pipes. The former capitulary library houses a parish museum, which is open to visitors. It contains the remains of the old outfit of the collegiate. Unfortunately, the rich vault as well as the collection of books and manuscripts largely scattered after World War II. The St Nicholas Church, in Baroque style, built from 1736-1741. At present it is a Greek Catholic parish temple. The Stork Tower with fragments of the medieval city walls. The tower owes its name to storks which have nested on its top. At present the tower is the residence of one of the sections of the Cultural Society. In the summer season tourists can visit a miniature museum created by the members of the society. Wikimedia Commons has media related to Dobre Miasto.